The growing Asian and Hispanic segments of the U.S. population represent an expanding market for specialty vegetables. The so-called “Boniato-type” sweetpotato is a popular crop among these ethnic groups, but is not typically grown in the U.S. This study was designed to assess the suitability of various boniato-type sweetpotato varieties for production in North Carolina. Eighteen varieties were evaluated based on measures of quality, yield, appearance, and disease susceptibility. The cultivar ‘Japanese’, a variety for Asian markets, was found to be the most promising. The cultivar ‘Picadito’, suitable for Hispanic markets, shows limited adaptation to NC growing conditions. Through appropriate selection of cultivars and attention to the disease susceptibility of each variety, North Carolina growers can become leading producers of these specialty sweetpotatoes. None of the new clones tested were as good as the clone ‘Japanese’, which was identified by this project previously as the best cultivar currently available for N.C. growers. The main reason for dropping clones was poor adaptation: most had poorly shaped roots, significant appearance problems (e.g., cracking, skin discoloration, etc. ), and low yield. Selected clones and their yield and appearance ratings are included in tables 1-4 below. 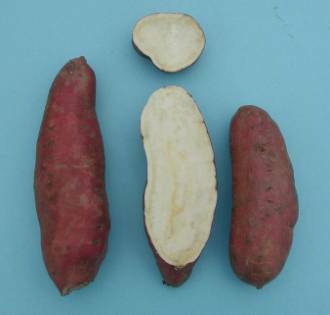 One of the weaknesses of the cultivar ‘Japanese’ is its susceptibility to the sweetpotato feathery mottle virus (SPFMV), which is thought to induce a syndrome called russet crack, causing a rapid decrease in yield and quality. In this year’s tests there was significant difference in total marketable yield at the Kinston site for the virus-tested planting stock vs. infected stock, 607 bu/ac vs. 414 bu/ac respectively. This is reflected in the grading, where the MPU stock had 51% No.1 roots and 7% culls vs. 42% No.1 roots and 24% culls for the infected stock. The differences in Clinton were similar, with MPU derived seed resulting in 50% No.1 and 22% culls vs 38% No.1 roots and 32% culls for infected planting stock. These tests clearly indicate the importance of using clean planting stock for the cultivar ‘Japanese’. None of the clones selected for the Hispanic markets performed very well. The main cultivar used for this market, ‘Picadito’, was included in the Kinston test (Tables 1-2). It typically produced only 1-3 roots per hill, which resulted in 54% of the roots being jumbo grade, 36% No.1, 3% canners, and 6% culls. Based on these results, it could have been harvested earlier. The tendency for jumbos may not be a major problem for this variety since the size requirements for its market segment are not as strict as those for orange-fleshed tablestock sweetpotatoes. This is an important concern, since there are no alternative outlets for this type of sweetpotato. Roots are characteristically heavily veined, but are not culled for this characteristic since it is an accepted trait for this cultivar. Yield for ‘Picadito’ was less than both ‘Japanese’ and ‘Beauregard’. 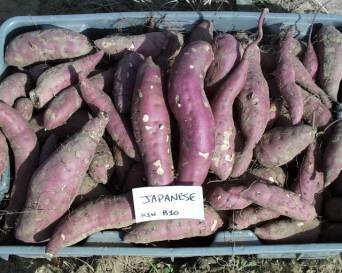 The best available sweetpotato cultivar suitable for Asian markets in NC is ‘Japanese’. ‘Picadito’ is the most widely grown cultivar for the Hispanic markets, but it has limited adaptation to NC. Both are susceptible to root knot nematodes and soil rot or pox disease. ‘Picadito’ is also susceptible to Fusarium, while ‘Japanese’ is susceptible to russet crack. Because of the disease susceptibilities, each variety should be grown with a sound rotation program and clean planting stock. Virus-indexed micropropagated plants are available from the NC State Micropropagation unit. Contact Zvezdana Pesic-VanEsbroeck at 919-515-7781. In order to take advantage of the growing Hispanic and Asian markets for sweetpotatoes, NC growers need adapted cultivars suitable for these markets. Last year at least eight growers grew ‘Japanese’, ‘Picadito’, or both with an acreage estimated to be greater than fifty acres. Orders for plants from the MPU this year suggest more will be grown this year. We believe that the potential for these markets has not been reached and that, given suitable cultivars, NC could be a leader in the production of these types of sweetpotatoes. Fig. 1. ‘Japanese’ sweetpotatoes harvested at the CRS, Kinston 2001. See data provided in Tables 1-4 below for yield and appearance ratings. Table 1. 2002 Boniato Yield Trial at CRS, Kinston, NC. Planted: 13Jun02; Harvested: 22Oct02; Days to Harvest: 131. Table 2. 2002 Boniato Yield Trial at CRS, Kinston, NC – Trait Data. Please see Keys to Tables section at the end of this report for descriptions to the abbreviations. Table 3. 2002 Boniato Yield Trial at HCRS, Clinton, NC. Planted: 04Jun02; Harvested: 23Oct02; Days to Harvest: 141. Table 4. 2002 Boniato Yield Trial at HCRS, Clinton, NC – Trait Data. Please see Keys to Tables section at the end of this report for descriptions to the abbreviations. Storage root data: MAT=maturity E=early, M=mid and L=Late; DM=percentage dry matter; L/D=length/diameter ratio; SKC=skin color clr=clear cu=copper, lt=light, or=orange, pi=pink, pu=purple, rd=red, rs=rose, tn=tan wh=white; SKT= skin texture, m fl= moderate flakiness of skin, lt fl= light flakiness to skin, ms=moderately smooth, sm=smooth; FL=flesh color (0-5 scale where 0=pure white, 1= cream, 2=yellow, 3= medium orange, 4=deep orange, 5= very deep orange; EYE=eyes(0-9); LEN= lenticels (0-9); SH=Shape (see shapes below); SHV=shape variability(0-9); APP=overall appearance (0-9). All 0-9 scales go from low or poor to high or good. Comment codes: AT=tough attachment; B=bumpy shapes; BR=breeding only; BSR=bacterial soft rot; CR=cracking; CRK= crooked shapes; CS=circular spot; CV=skin color variation end to end; D=drop; EY=deep eyes; FB=fleabeetle damage; HC=horizontal constrictions; ID=unspecified insect damage; IRR=irregular; JL=jumbo’s for length; L=long; LE=lenticels; LG=longitudinal grooves; LR=Lateral rings; LT=latex; MSH=misshappen roots; NS=nice shapes; OV=ovate or pear shapes; PI=pimples (0-9); PN=pencil roots; PP=pulled plants; R=rodent; RC=russet crack; RG=restaurant grade; RH=root hais; RKN=root-knot nematodes; RSK=rough skin; RT=rot; SD=skin discoloration; SH=sheen; SG=string roots; SK=skinning; SO=souring; SPR=sprouts; SR=soft rot; SS=stays short; SSR=streptomyces soil rot; STR=Striations; T=tails; TP=tapered roots VN=viens; SC=scurf; SF=surface Fusarium; WB=whitefringed beetle; WG=white grub; WW=wireworm; YCR=yellow cortical ring; YLD=yield; 2oR=secondary roots. • Juntos 4-H Program Named a "Bright Spot in Hispanic Education," by a White House Initiative.